Fatherhood is full of stressful moments, especially when your child is young. With the way the world is these days, you need to be able to reach your child at a moment's notice. You want to buy him or her a cell phone, but don't want to purchase an expensive and unnecessary smartphone. Luckily, there are many options available to you. 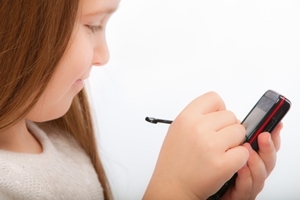 Labeled as the "smart phone for kids," these devices have parental controls that can limit usage and spending on apps. You can also manage your child's address book, blocking certain numbers from being accessed. There's even a GPS locator so you can know where your kid is at all times. Developed by FireFly, this phone allows kids to easily stay in touch with their parents. With no real bells and whistles, its battery can last more than 200 hours in standby. It comes with dedicated buttons for calling you at home or on your own cell phone, as well as emergency numbers. You can control all incoming and outgoing calls with a parental password, too. Aptly called the "Shrek phone," this easy-to-use phone is small, offering a perfect fit for your child's hands. It holds four numbers that you can program into the address book and it can't send or receive text messages.